As designers, the first step in taking our thoughts from a physical space to a digital one is often transcribing them from stickies and whiteboards into spreadsheets. This allows for greater collaboration with partners, advanced handling of data and information, and documentation. 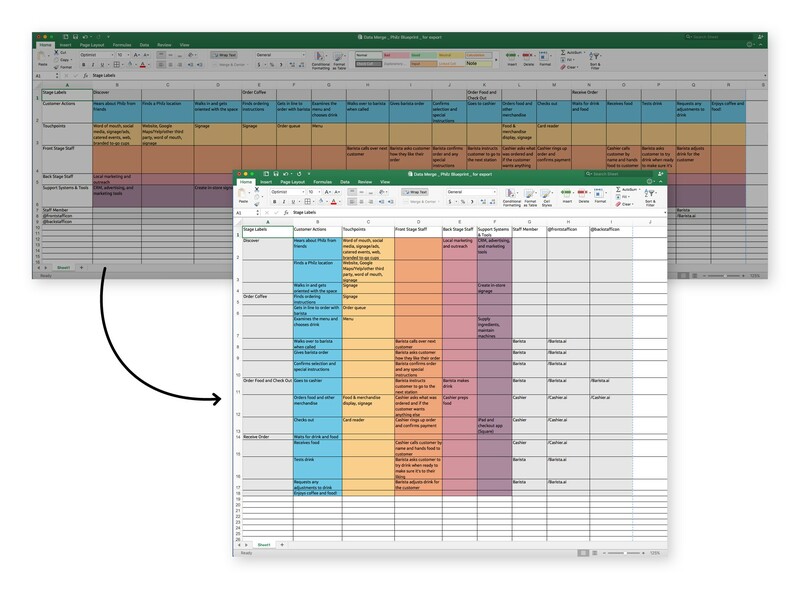 Transforming these spreadsheets into effective communication tools for presentations or workshops isn’t so easy. Wrangling the multitude of unique data bits and making sure the text is styled correctly, color coded, and easily updatable can be time consuming and frustrating at best, but transforming a sea of data into something visual is a powerful tool and will be well worth your efforts. 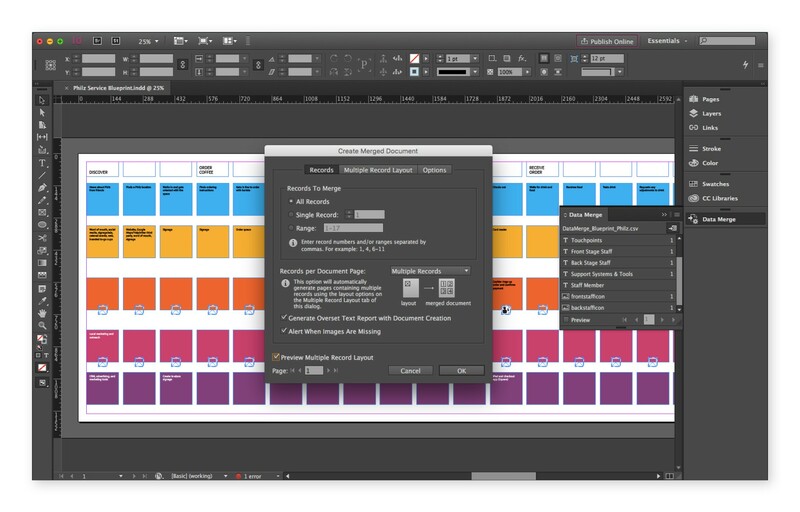 One tool we find useful for streamlining this process is InDesign’s Data Merge feature. Data Merge transforms large volumes of spreadsheet data into neat and orderly things like sheets of mailing labels, directories, or even infographics. 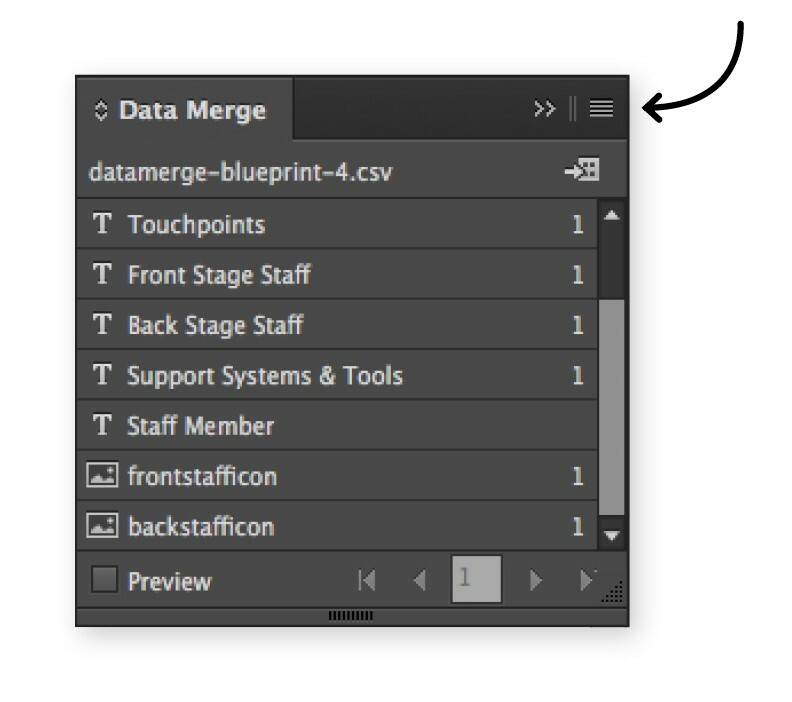 Data Merge takes the information you have in your spreadsheet and automatically places it in repeating elements within an InDesign file. We find Data Merge particularly useful when creating communication tools specific to the service design field like service blueprints, concept cards, and others things that require a lot of complicated data to be presented in a consistent manner. Data Merge helps us to produce these tools with ease while avoiding tedious and error-prone tasks like text styling and copy-pasting of repeating elements. You can think of the Data Merge function like an automated copy-paste ability on steroids. 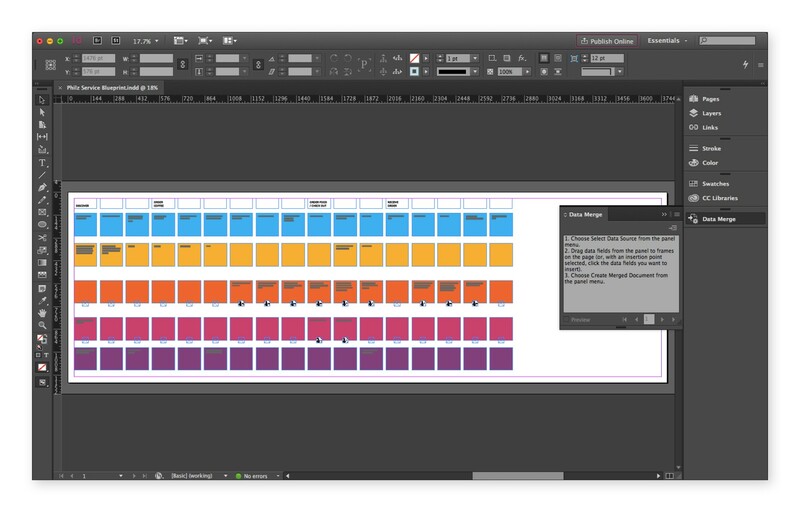 The process of creating project cards can be a speedy one when using InDesign’s Data Merge feature. 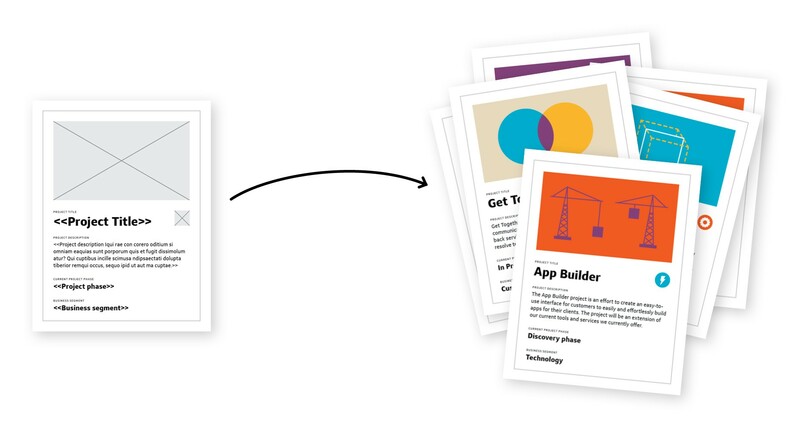 Here is an example project card template and its final output after a Data Merge. In this guide, you’ll get an overview of how Data Merge works, learn what common (but non-obvious) bugs to watch out for, and gain some pro tips and additional resources. Before you know it, you’ll be known as the Data Whisperer. 4. Doing the Data Merge Dance! To begin, you need to have a spreadsheet application that can export to a .csv file (Microsoft Excel, Apple Numbers, and Google Sheets all work) and Adobe InDesign. If you’d like to follow along with our example files, you can download them here. The zip includes an example spreadsheet file and an InDesign template. Next, collect your files for Data Merge. Include everything you are going to use for the data merge inside the same folder (so not sub folders), including your InDesign template, spreadsheet file, and visual assets. To give you an example of how we use the Data Merge technique in our design work, we put together a service blueprint detailing an experience at a Bay Area-based coffee shop known for their individually handcrafted coffee drinks. A service blueprint, in short, is an operational tool that visualizes the components of a service experience in enough detail to analyze, implement, and maintain it. It helps us to communicate and see how the experience will be supported by staff, operations, and systems within the service. If you’re not going to make service blueprints, don’t fret! The steps outlined below can be useful in creating a myriad of file types: service blueprints are just our most common use case of Data Merge, whereas creating something like a set of project cards is more straightforward and would be a great starting place for beginners. To begin the example service blueprint for this blog post, we “conducted research” (i.e., buying coffee and hanging out). We then organized our observations into a rough draft service blueprint. Our initial blueprint showing customer and staff actions, touchpoints, experience stages, is complete, but as a whiteboard and stickies draft, it’s not yet a version we can share or talk about easily with others. 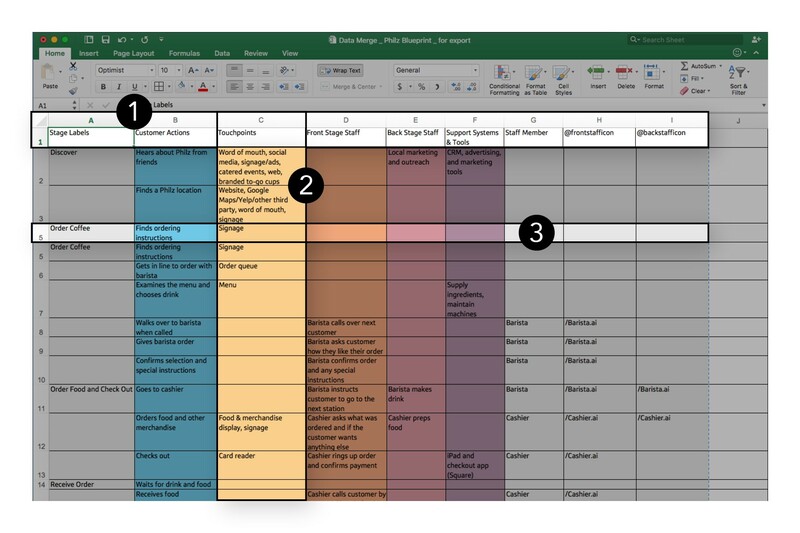 To bring this blueprint draft from an analog matrix of stickies to a digital form we could more easily refine and collaborate with, we still need to transfer the information to a spreadsheet. The insights collected during research has been labeled and entered into a spreadsheet application. To transpose, copy all your data, click into an empty area of the spreadsheet (or a new sheet), and edit > paste special > transpose. You can then delete your previous rows and save the newly-formatted spreadsheet as a new file. The Data Merge feature looks at spreadsheet information in the following ways 1) data field names, 2) data fields, and 3) records..
Data Merge only reads .csv (comma-separated values) and .txt (tab-delimited text) files; we’ve chosen to work with .csv. Exporting spreadsheets to these file types strips them of formatting, formulas, and special characters. Make sure to remove any line breaks within cells, including soft returns, as they won’t be imported properly. Data Merge doesn’t just place text — you can add images to the data you import, which will be placed into image frames and linked just like any other graphics in InDesign. To have Data Merge place an image file, create a new column (data field) that will tell InDesign to import your images. Begin the column heading (data field name) with an “@” symbol (this marks the data field as external files to be linked). In the cells below, enter a ‘/’ and corresponding file name, including the extension (.png, .jpg, .ai, etc.). Your file name should be formatted like this “/example.ai”. Make sure your image file names are exactly the same in both the .csv file and InDesign file. Our example blueprint includes icons to visually denote which staff member is involved at each step. To get your Data Merge to include icons, create one column in the spreadsheet where you’ll specify the icon file you want, in our example, the staff member icons. We wanted to have two different icons for the front-stage staff boxes in our blueprint, “barista” and “cashier”. If your final design has repeating elements (reference example below) be aware that you only have to set up a single example of the repeating element, as the Data Merge will auto-populate the rest of the final design (see Step 4 for more detail on how to properly set up your spreadsheet to create repeating elements). A Data Merge template is a master InDesign file that uses placeholder elements to represent where the information and images will be merged into from your spreadsheet. When designing the template, include anything that will be a repeated element in your final design and contain the data from your spreadsheet. These repeating elements could be a number of elements together, like a project card and it’s different fields, or a single element, like the blueprint boxes in our example. In this example template, we’ve set up frames for each of the channels, icons, and stage labels; these will repeat in every column of the blueprint we’re creating in InDesign. Be aware that you only have to set up a single example of the repeating element, as Data Merge will auto-populate the rest of the final design (see Step 4 for more details on how to properly set up your spreadsheet to create repeating elements). Blank template. Only one iteration has been designed; Data Merge will repeat the iteration across the page. Designing as much as possible before merging the data, including colors and styles, will simplify later processes and will make re-merging much quicker if it becomes necessary. Any structural elements that are not repeated, like titles, labels, and keys, will be added after the data is merged. Each of your data fields should now appear in the Data Merge panel with an icon that denotes what type of data it holds (text or image). Drag and drop the data field names to their proper frames. Text frames can hold more than one text placeholder, and line breaks and other connecting symbols or strings can be added here. Placeholder text should appear as <<data field name>>* (placeholder text for images may not appear depending on the frame size). Continue to format the template as desired. Template with placeholders dragged and dropped from the Data Merge panel. 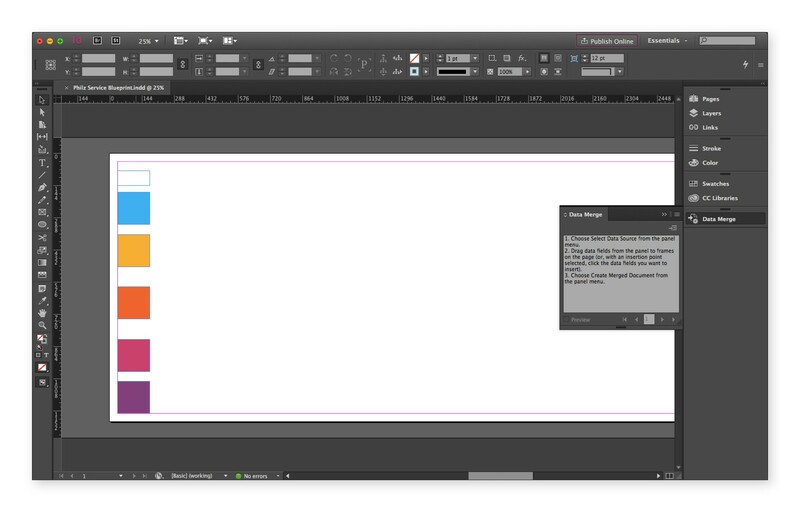 When you’re happy with your InDesign template, click the fly-out menu icon (located in the upper right-hand corner of the Data Merge panel),here you can choose to preview the results of the merge, and when you’re happy with the results, click the “merge” option in the fly-out to create your merged document. When creating the final merged document, you’ll have some options on how that will take place. Choosing to put multiple records (rows in your spreadsheet) on one document page will create repeated iterations of your template with each of your records, while putting a single record on a page will create a new page for each record. For service blueprints, we choose to put multiple records on one document page to create repeated iterations of the template containing each of the records. The “Multiple Record Layout” tab—relevant only if you choose to put multiple records on a page—allows you to control the spacing, margins, and layout of new records. Lastly, the “Options” tab is important especially for placing images in frames of different dimensions within the template, since it includes an option for fitting preferences. Merging the data will create a new InDesign document, so save both the template and the merged document. The merged document is complete! After you’ve merged the data into the template, it’s likely that you’ll want to add some final touches or make adjustments before sharing it with others. You will also need to delete any of the blank elements that were created in the Data Merge process. 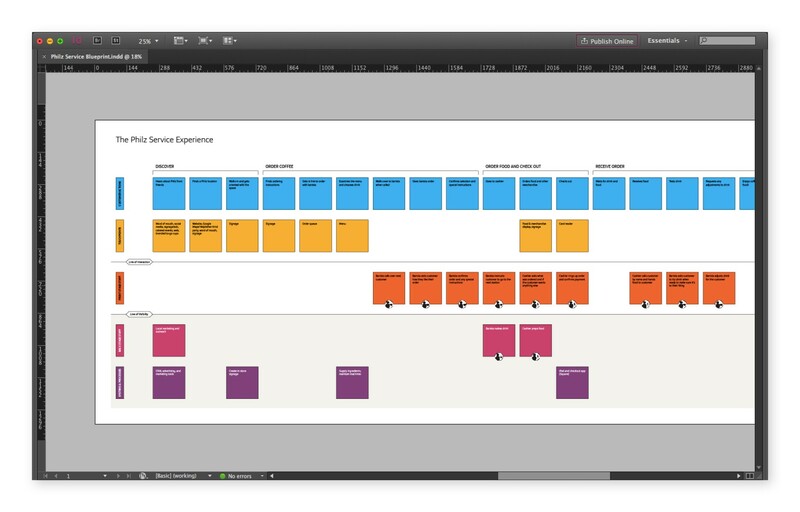 On our service blueprint, we removed the empty squares, added flow lines, the line of visibility, experience stage labels, and or course, a title. And there you have it! The completed service blueprint, ready for sharing! My spreadsheet looks clean but some of my data is in the wrong place or even missing! Empty-looking cells can be riddled with hidden or invisible characters. Try deleting all of your empty cells and import again. If this doesn’t work, using a .tsv file instead of a .csv file, or copying the data into a new spreadsheet may help. I can’t get InDesign to import my .csv file and I’m getting a weird error! It’s likely that your .cvs file is still open. Close it and check again. Leaving it open prevents InDesign from importing it. I’ve typed in “<<data field name>>” into my template but it’s not importing data! You must either drag-and-drop or, having clicked into a text frame, click on the correct data field in the Data Merge panel. Ugh. I’ve updated some information on my spreadsheet but I don’t want to do the whole thing over again! After making changes to your data, you can re-save your .csv file and update the link to InDesign by selecting Update Data Source from the Data Merge panel’s drop down menu. My design is shifting on the page after the merge! This usually happens when the page size is adjusted from the original size when the page was created. The Data Merge function only references the original file measurements. Creating a new file at the final size you need should clear up the issue. I’m trying to merge several sheets but InDesign isn’t importing all of the data! InDesign has trouble handling multiple sheets into one template. If you have multiple sheets, you’ll either need to consolidate them into one or export multiple .csv files. I’d like to merge something that requires a list format, with line breaks, but I though those don’t work?! The easiest way to include line breaks is to separate the text into spreadsheet columns based on where you want the line breaks to occur. Then, when you’re setting up your template, separate their placeholders with line breaks. Writing formulas once and dragging them into adjacent cells will save you from typing the same information into individual cells over and over. The concatenate function can read and combine characters from individual cells together to form a string. We use this feature, together with the “if” function, to toggle icons on and off. For example, the Google Sheets formula =IF(ISBLANK(G8)=FALSE,”/”&CONCATENATE(G8)&”.ai”,””) first checks if cell G8 is blank. If it is, nothing will appear in the new cell. If G8 contains information, Google Sheets will use the contents of cell G8 to insert “/(G8contents).ai” into the new cell. To color-code, create vector image files that are solid blocks of color and add them as you would any other image to your template. This is particularly helpful when creating sets of cards that should be easily categorized or sorted. Find the longest records in your spreadsheet and use them as placeholder text to design your template. You’ll have fewer fixes with overset text after you merge.